In 1943, Brendan O'Regan opened a restaurant and coffee shop in the Foynes terminal building. This restaurant had been considered to be one of the best restaurants in Ireland at that time. Chef Joe Sheridan, originally from Castlederg, County Tyrone, had been recruited by Brendan. Late one night in the winter of 1943 a flight departed Foynes for Botwood, Newfoundland. After flying for several hours in bad weather conditions, the Captain made the decision to return to Foynes and await better conditions. A Morse code message was sent to the control tower at Foynes to inform them of their return. Staff were contacted to return to work and when the flight landed they were brought to the Airport Restaurant for food and drink to warm them. When Joe was asked to prepare something warm for the passengers, he decided to put some good Irish Whiskey into their coffees. One of the passengers approached the Chef and thanked him for the wonderful coffee. He asked Joe did he use Brazilian Coffee? Joe jokingly answered, "No that was Irish Coffee!!" A few weeks later, Chef Sheridan knocked on Brendan O'Regan's office door. He showed Brendan this new drink in a stemmed glass and asked him "How about that for eye appeal". Brendan answered "Genius Chef" and so began Irish Coffee. 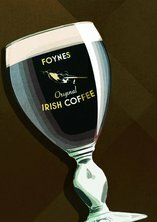 Irish Coffee continued to be served at Foynes to all passengers and is still served to this day to all dignitaries arriving at Shannon Airport. for full details goto www.flyingboatmuseum.com, Foynes and flying boat museum.